Thomas Dunne Books, 9781250125606, 336pp. Bruce Campbell is the ultimate “B” actor with an ever-growing fan base. In addition to starring in the huge cult hit Evil Dead series and a series of independent genre films, he has had featured roles in the film Bubba Ho-Tep, the Spider-man movies, the blockbuster Congo, the award-winning independent crime drama Running Time, and Paramount’s romantic comedy Serving Sara. Bruce has also done a lot of television work, including appearances in Disney’s TV movies Gold Rush and their update of The Love Bug, and has also starred in the highly touted Fox series The Adventures of Brisco County Jr. Bruce then appeared as a recurring guest star on the hit shows Lois and Clark: The New Adventures of Superman, Hercules: The Legendary Journeys, Xena: Warrior Princess, Ellen, and Showtime’s edgy TV industry comedy Beggars and Choosers. 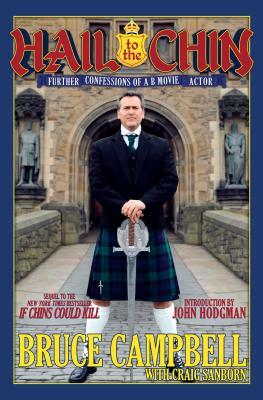 Bruce Campbell is also the author of the bestselling books If Chins Could Kill and Make Love the Bruce Campbell Way. HAIL TO THE CHIN co-author Craig “Kif” Sanborn has been working with Bruce Campbell for more than twenty years, contributing artwork and humor for all of Campbell’s self-referential works, including If Chins Could Kill: Confessions of a “B” Movie Actor, the novel Make Love! the Bruce Campbell Way, the feature film My Name Is Bruce, and Campbell’s own social media persona.